The number of smart buildings will increase while getting smarter, measured by how much their technologies improve experiences and outcomes. Experts predict there will be upward of 22.5 billion devices connected to the internet of things (IoT) in 2021. 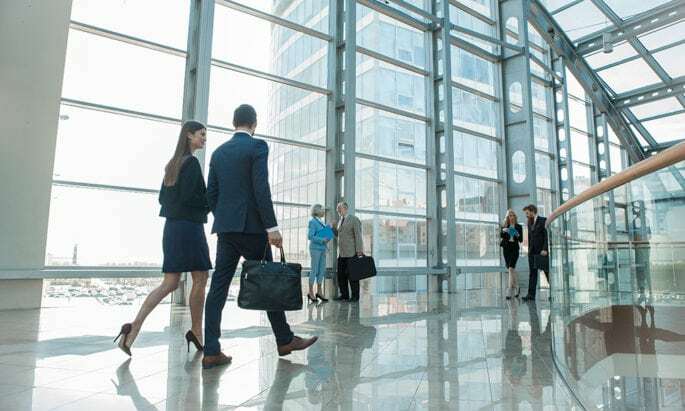 It’s becoming increasingly important to connect and integrate these devices in the most secure and useful ways possible, especially in the spaces you do business. Thanks to IoT, smart homes and other buildings integrate features like lighting, temperature, appliances, computers, alarms, and other devices to provide a more comfortable and convenient experience to occupants. Smart technologies are controlled through programming, sensors, or voice control. They are also used to manage systems when buildings are unoccupied. 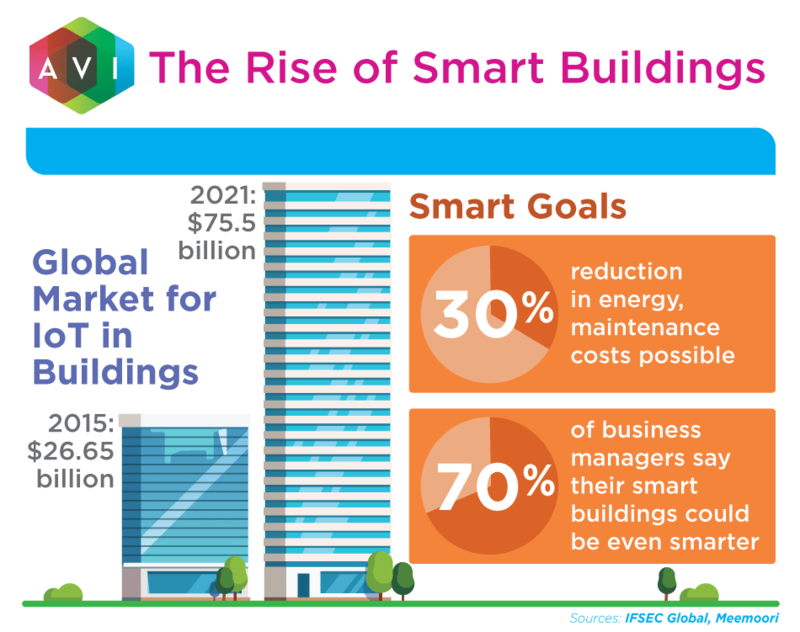 The ways you can use smart building technologies are growing. One example is that wearables will begin to play a larger role in controlling the tech in your spaces. For example, your smartwatch will be able to communicate to your thermostat that it's time to adjust the temperature because you’re heading home. Smart enterprise buildings will be able to do all the things smart homes do, but they will have to meet additional needs and include additional capabilities like meeting room automation, more comprehensive safety features, and detailed reporting on the usage and efficiency of rooms, equipment, and more. Facilities managers will no longer think of lighting, heating, air conditioning, ventilation, or controls as distinct systems because building automation will manage them all under a single system. Buildings will operate more efficiently and be easier to manage despite increasingly complex integration. Your employees: Workers will benefit from automated processes that will save them time and prevent frustration caused by struggling with equipment. They’ll also be safer and more secure in a building with automated alarms, sensors, and security features. Your customers: Visitors will feel more comfortable in a building with a controlled environment. In addition, a smart building can provide personalized access and information to guests, based on their reasons for visiting. For example, you can provide visitors with a smart badge that provides access only to areas they will need to go and that activates digital signage to provide information specific to their visit. Your company: Your organization can boost its bottom line by saving money caused by energy waste and inefficiency. You can easily control things like temperature and power consumption based on use and occupancy. Smart safety and security features can also reduce liability. Predictive maintenance improves productivity because equipment can be repaired or replaced before it malfunctions and disrupts work. The environment: Commercial buildings account for 30 to 40 percent of energy use, so smarter energy consumption now can have a big impact on sustainability. Smart technologies can make buildings “greener” and improve the environment at large as well as the environment for occupants. In addition to improving energy efficiency, sensors can also monitor air quality within the building and more. Aside from these direct benefits, smart building technologies can help managers and executives in your organization make better decisions. Being informed about use, employee preferences, and the like can help you make adjustments to their environment and recommend best practices. Check back with future blog posts to read about more 2018 tech trends, including cloud services, virtual workspaces, and others. In the meantime, read more about improving control systems in your meeting rooms.